But a friendly warning - Once here, some guests never want to leave the indulgence of the Villa itself !! Welcome to our desert home! We invite you to enjoy the amazing southern Arizona weather, active outdoor lifestyle, limitless wildlife, and tranquility of the Sonoran Desert. Set on 3+ private acres, with mountain and desert views, vast natural desert open space, lush landscaping and resort-like amenities, Casa Campana provides a perfect location from which to explore southern Arizona or utilize as a private destination retreat for rest and relaxation. Once arriving, some guests find they never want to leave the villa! 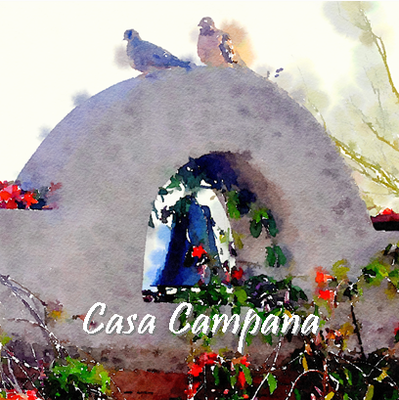 For those who do venture out exploring Tucson's many wonderful sights and activities, Casa Campana is a welcoming oasis awaiting their return.
" 5 Star Vacationing in the Desert - The RITZ-CARLTON of Vacation Homes"
" THE PERFECT PLACE TO RELAX & REJUVENATE"
" PARADISE!! Can't wait to go back! "THE ULTIMATE DESERT OASIS - Mark & Susan have captured the essence of vacation hospitality"